Let’s just push past the whole inherent irony of naming a product category “smart dumbbells,” shall we? This is 2016, we’re living in the future. And really, if something isn’t connected to a smartphone, does it really exist? No. Of course it doesn’t. 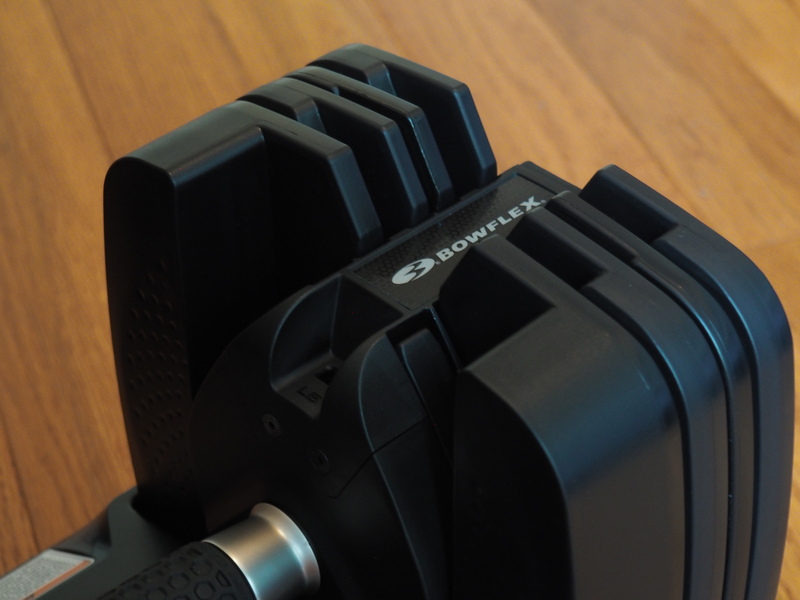 BowFlex has been showing off it ST560 Smart Dumbbells for a couple of years now, and, much to the chagrin of my poor, poor FedEx delivery guy, the things finally started shipping this year – and, for the record, are extremely unpleasant to lug around in 95-degree New York City humidity. Inside, things are decidedly more pleasant. Here we can sweat on purpose, in tightly controlled reps monitored and logged by the home fitness company’s 3DT mobile app (iOS or Android), registering a jaunty chime for every completed lift. The dumbbells themselves are different from the kind I’m accustomed to at my friendly neighborhood New York Sports Club. This is due in no small part to the weight adjustment feature, allowing each one to hold anywhere between five to 60 pounds. The weight is displayed as both kg and pounds, on the two sides, the numbers, changing as you rotate the bar to adjust the weight with a click for each 2.5 pound increment. Pretty handy – and decidedly less embarrassing that buying a pair of five-pounders from the company (and likely cheaper than going for the full set). Whatever weight you chose will stay attached to the dumbbell and the rest will stay behind on the stand. 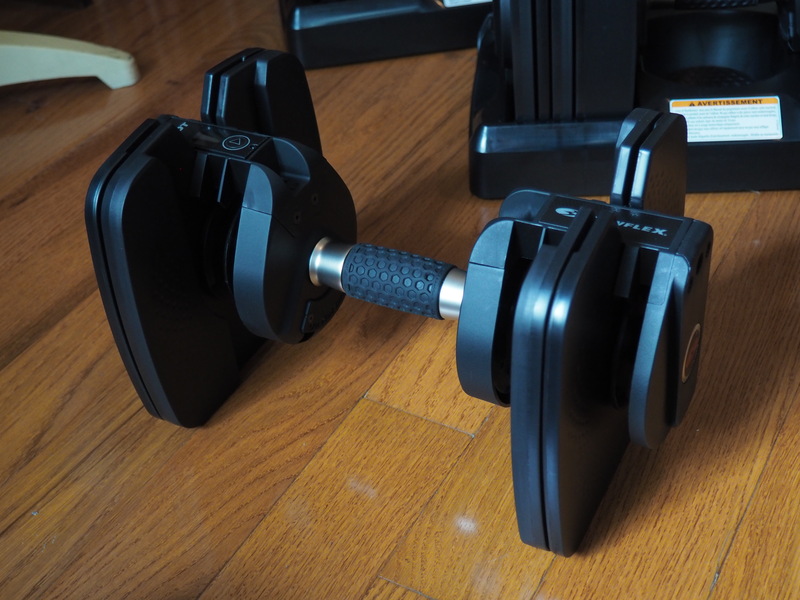 The downside is that the dumbbells are quite large – and when you’re lifting less than the full 60 pounds, the unit has the tendency to jiggle around – not quite the solid mass of self-contained analog systems. The 560s connect to a smart device via Bluetooth, keeping tracking things within a 10-foot range. 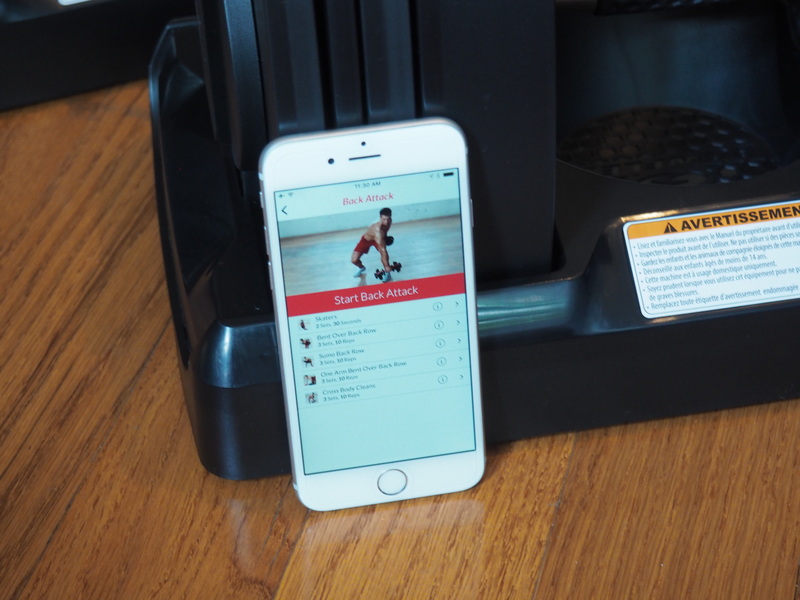 Flip into Just Lift mode and the system keeps track of reps, calories burned, time and total pounds lifted (which starts to look pretty impressive pretty fast) and lets you know how long to rest in-between. The tracking is pretty solid, though I did have a few miscounts. On a whole, the localized sensors seem to be more accurate than what many wrist-worn wearables are capable of. The app features a slew of different workout options, including a six-week strength training plan and around a dozen different exercises. Users can customize their own, as well. There’s also a Journal option that archives workouts and a slew of different instructional videos to show you how to lift right. A pair of dumbbells runs $499 – and an extra $100 bundles in the weight rack, which offers a handy place to stash a mobile device. It’s a pretty loft price to pay for not having to keep track of reps in your head that at this point feels more far more like novelty than necessity.